So since I can’t really remember everything I meant to tell you/me, let’s just randomize and see what happens. Not only have I purchased most of the Christmas gifts, I have also wrapped them in identical wrapping paper from Costco. Did you know Costco wrapping paper is superior to all other wrapping paper? It’s thick and each roll holds so much more wrapping paper than the stuff you buy in a four pack at Target or Walmart or wherever. I hate running out of wrapping paper. I also did all the Christmas decorating myself. My sidekick, my 14-year old daughter, has abandoned me for her friends, of which there are many. I left the tree without its ornaments for a whole week, but finally hung them myself. I haven’t actually put ornaments on a tree in years and years. I felt a little sad about that but my friends tell me that the kids will come back around one day when they have their own kids and I say that’s far too far into the future to comfort me much at all. So, bah-humbug. In other news, I spent the last two months reading all nine books in the “Little House” series by Laura Ingalls Wilder. I realized as I read them that I had only read the second book in the series when I was a girl (my dad gave it to me in 1977 as a gift) and I had to remedy that oversight in preparation to read The Wilder Life by McClure. And now, finally, that’s what I’m reading. As I hear the Christmas song, “Jingle Bells,” I think of Almanzo Wilder courting Laura Ingalls by taking her sleigh-riding up and down the streets of that prairie town in South Dakota. So, yes, perhaps I’ve been a little overly immersed in the pioneer days. I am longing for the simpler days of yore, which is hilarious, really, considering how much I love the comforts of modern life. Oh! The craziest thing happened a week or so ago. Out of the blue, an Internet friend sent me a text message of the city sign near me and said, “Guess where I am? !” She lives in Oregon and I live in California, so I was surprised to say the least. She and her husband were in town to celebrate their 25th wedding anniversary and she invited me to meet her at Starbucks a few days later. And so I did. Meeting someone in person that you’ve known online (and through text messages) for years is always an iffy proposition. What if you each think the other is a weirdo? What if conversation is awkward? I’m happy to report that we hit it off and talked like old friends. Finally, I had to hurry off to an obligation, but it was super fun to meet her and talk in person. In other other news, the kids are all wrapping up their schooling before Christmas break. One more day and then we’re home free. My 18-year old finished his first semester at community college while his brother completed his who-knows-which-semester at the same community college. My daughter is halfway through eighth grade. She is looking forward to high school, though her ideas about where she should attend change every other week. Keeping up with a modern-day middle-schooler is fairly exhausting. Also, just so you know, I bought a car. It’s used, but I bought it from a dealership with less than 15,000 miles on it. 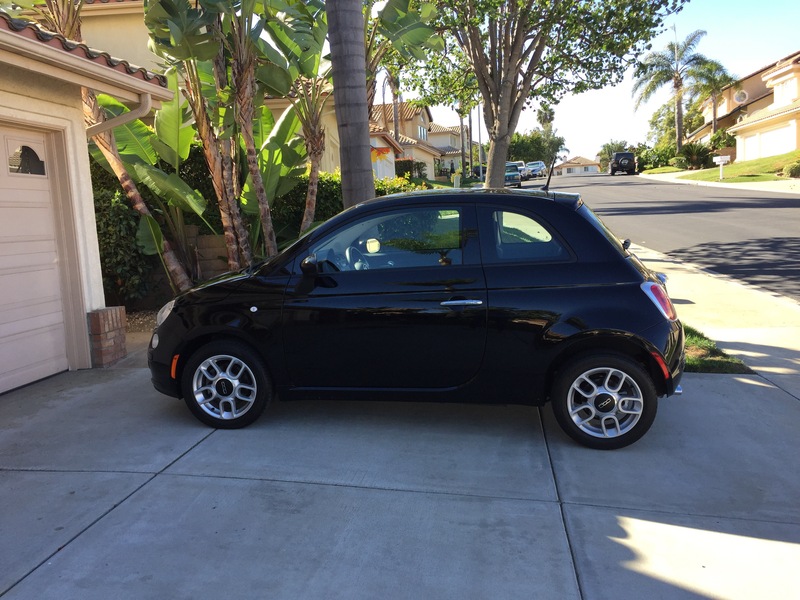 It’s a black Fiat 500, a two-door car with two tiny back seats which fold down to create almost enough cargo space to stash a Costco haul. I’m very happy to have a tiny car that is so easy to park and that has good gas mileage. My husband scoffs at my tiny car and has all-but-refused to ever drive it which is completely fine with me. After sharing a mini-van (and whatever other random second car we’ve had) for ten years, I’m delighted to have my very own car. The funniest thing was that I bought it on Election Night. I hadn’t exactly meant to watch Election Night results with the guys at the car dealership (I thought I was just picking up paperwork and that I’d have to take it to my credit union the next say), but as it turned out, they did everything on the spot (I was pre-approved) and so I sat around while waiting for the salesguy to do the mysterious car-buying stuff in another area and watched the computer screens with the other salesmen who had no customers. It was just me and the guys and one woman salesperson who refused to believe that Trump really was winning. When Trump won Ohio, I declared with great authority that he would win the whole election and the guys said, “You think?” and I said, “Absolutely. Just wait.” I knew this because my husband watches news channels constantly and so I absorb this political knowledge by osmosis while I’m in the same room, reading. So I will always remember Election Night 2016. Well, it won’t be so long until the next time I post here. I’ve just about convinced myself that blogging more regularly (dare I say, every day?) would be a gift to myself that I would really treasure in the years to come. So, don’t hold your breath or anything, but meet me back here sooner rather than later. Yes, I had to decorate the tree myself too. 13 yr old and 26 year old truly, truly, didn’t want to. Weird time in our lives. Sigh. I don’t like it! Hope you’re feeling some holiday cheer anyway!